or any combination of the two! In this article I will tell you how making 1 cut per board you can turn 10 sheets of the 2x4 melamine from home depot into 2 racks! 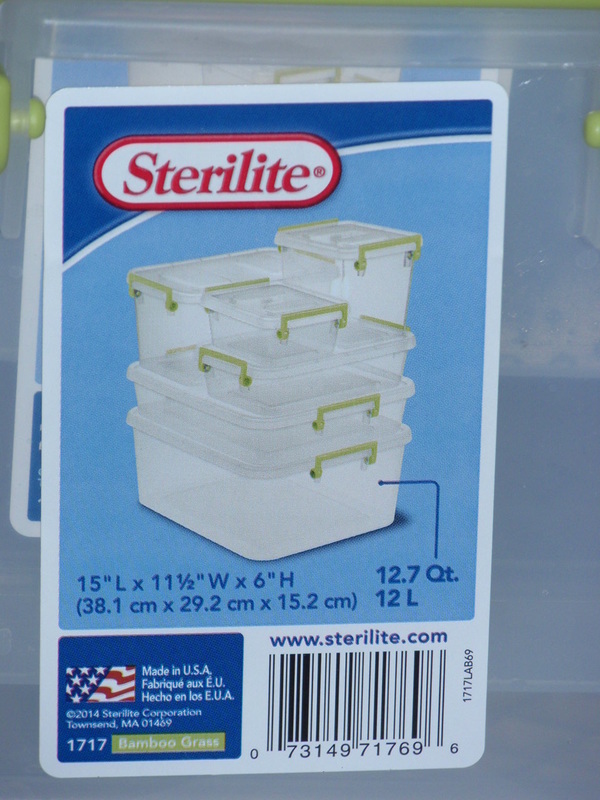 One that holds 18 28qt tubs and a second rack that holds either 9 28qt tubs or 18 12qt tubs or any combination of the two! 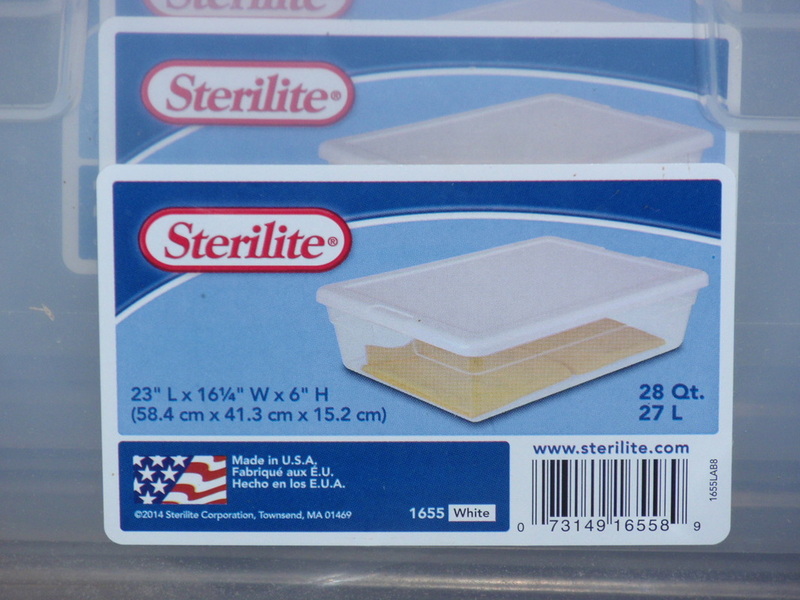 The 2x4 sheet would fit 3 28qt tubs perfectly on each sheet and oh yeah I have tried it. 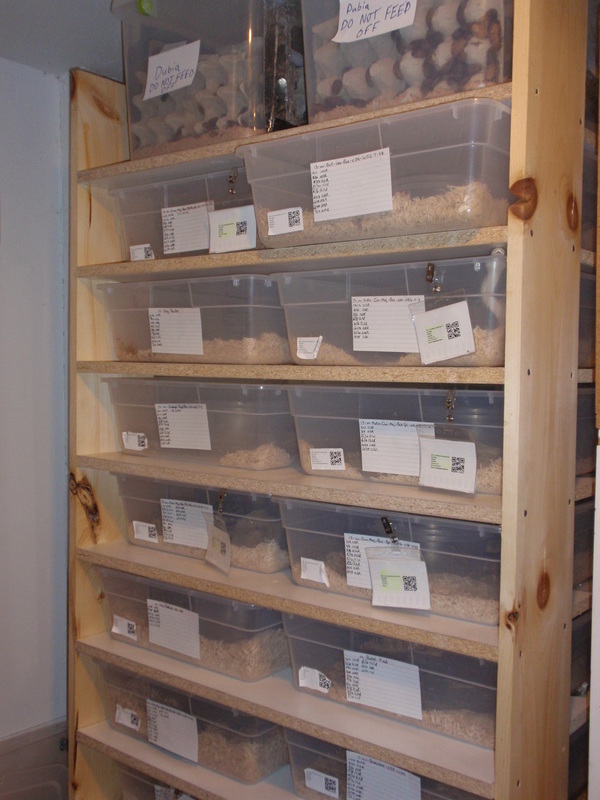 Over time the middle just sags a good bit with snakes and bedding on a 4' wide rack. I just found it is just better to make a cut so it holds 2 28qt racks and turn the "scrap" into an awesome versatile rack that has several uses. Beats throwing it away that's for sure! 10- precut 2' x 4' melamine shelving boards from Home Depot. At about $2 per foot I always...always... buy an extra foot or two JUST IN CASE something happens. You can easily cut off and discard an extra foot or two for an exact fit but nothing kills building a rack to roll out the heat tape and see you are a foot or less short!!! Measure 16 1/2 inches from the side and make your cut so you are left with a 16 1/2'' x 2' piece. Now repeat that step on all 10 sheets and stack them neatly to the side so you have your big sheet for the 18 tub 28qt rack and your 16 1/2'' x 24' sheet for the smaller rack. Now that everything is cut you will need to get started with your casters by first building the box frame. Be sure to use your square as you screw the corners together to make sure everything goes together square. Larger Rack - 2 2x4's cut 32 1/2 inches and 2 2x4's cut 21'' laid out so the smaller boards are on the inside of the rectangle making it a 24'' side when butted with the 2 longer boards. Smaller Rack - 2 2x4's cut 16 1/2'' and 2 2x4's cut 21'' laid out so the longer boards are inside of the rectangle making it's side 24'' when butted with the 2 shorter boards. Before you start screwing make sure that the 2x4 frame is square to the melamine and everything is flush. Once you are satisfied the pieces are lined up right take your drill and drill a pilot hole in one of the corners and tack the board down with a screw. Repeat this process for every corner making sure the frame stays lined up in the right position. Once you get the second screw in you're not going to be able to adjust it. After all four corners are tacked down add another screw in the middle of the board long ways just for good measure. the amount of empty tubs you are about to give yourself here with these 2 racks! If everything looks square move your tubs out the way and proceed with the build! Every time I built a rack there was something that I wish I'd done different after it was built. Making sure the bottom is good and insulated is one of them! For this rack I actually stuffed 2 layers of R-13 insulation inside my casters. You can see the top piece in the photo. There is actually a second piece stuffed in below that one. This step is optional, but it's a step that I would never build a rack for myself again in the future without doing. If you decided not to use insulation you can skip this step if you'd like. If you did install insulation, just go ahead and make sure it's packed in there nicely and place your cut plyboard piece on, make sure it's all flush with the frame and screw it down. If you don't feel like buying and cutting a piece of plyboard to fit, you can easily use a piece of precut melamine for the top and bottom of the caster. I just prefer to use plyboard because it's significantly lighter than the melamine. and align them along the bottom sides of the caster. Let the 2x4 hang over the edge and back of the caster box the thickness of one of the 6 foot posts for the side braces. This way there is a slight lip for the braces and back to rest on for added support. Screw the 2x4's down so that your screws hit the first 2x4's you used to make the sides of the caster. Once the first boards are screwed to the caster box repeat that process so there are 2 2x4s double stacked and ready for wheels. This gives a little extra space to get a broom, mop, or shop vac under the rack! You can either use some heavy duty wheels that you screw down with 4 screws or the type that you drill a hole in the wood and hammer the peg to the wheels into the caster board. Whatever type you decide just make sure they are heavy duty and put one on each corner! After you install the wheels, flip your finished caster over and now you are ready to add your braces and build your rack! Add your 4 6 foot posts to the sides with a 1x6 post on each of the front side corners and a 1x4 post on each of the back side corners. Make sure you only use one screw so that you can make sure the rack is square and level once you get up a few levels. If you put in more than one screw the brace will be stuck in that position. Take your 4 blocks that were cut 5 5/8 inch and place one in each corner. Then place a shelf board on top of the blocks. Pressing the shelf down on the blocks will make sure that every shelf you add has a uniform opening. Now go around to each corner post and make sure the corner brace post meets flush with the front edge of the shelf. Then, after checking everything is square, drill a pilot hole being careful to keep the bit straight and going into the center of the melamine board and then add 1 screw per corner post. Make sure you only use one screw still so that once you get up a few levels you can make sure 100% everything is square. Remember To Check Your Spacing!!! Go ahead and repeat that step until you are up a few more levels. AFTER EACH SHELF TAKE A TUB AND MAKE SURE IT FITS CORRECTLY!!! THIS IS A VERY VERY IMPORTANT PART OF ADDING EACH SHELF!! There is no worse feeling than making it up to the top of a rack and realizing you cut the spacer a hair to big or small and don't have the gap you want!! Every shelf I screw I take a tub and check the spacing. Much Much Much easier to correct a mistake as soon as you made it vs get all the way finished and have to take the rack apart! Now that you've gotten up a few levels on your rack, use a framing square or speed square to check that the shelves are square with the corner posts. Once you are confident the rack is square drill a 2nd pilot hole and add a second screw for each shelf on each post. Now that you have 2 screws in each shelf, the rack can not shift and is permanently square. Then go ahead and add the rest of your shelving. Alright you have now made it to the last shelf and have all major construction done! Now is the part of the build you just take a step back, admire your hard work for a second and let the gears start turning on what new animals you will soon have space for! I used 4 inch heat tape which I purchased from reptile basics. I always prefer to weave the heat tape in and out of every shelf in an S pattern and tape down to the bottom of every shelf with foil tape. This allows me to only have one connection where I attached the chord to the tape. I prefer the S shaped pattern because every connection there is a risk of failure. Lets face it most of us are not electricians and are reptile enthusiasts. I have seen plenty of people have 1 piece of tape per shelf and a jumper wire connecting each together. Every one of those is a potential problem if there was a mistake ever made or connection came loose. Doing one piece per shelf say your probe is at the top and the bottom half becomes disconnected. The bottoms tubs below the break will all be cold while the top are fine. Even worse would be if the probe was below the shelf that got disconnected and was on heat tape that no longer worked. The bottom would obviously never heat up and the top part would continuously run full power. BAD BAD scenario. When I run the tape in an S shape it will all work evenly no matter where I have the probe and I don't have to worry about there being 10 connections for a problem to ever occur. NOTE: On these racks we chose to run heat tape on top of the rack in the S weave. We chose to do so to allow us to put tubs on top of the rack with lids if we ever needed. 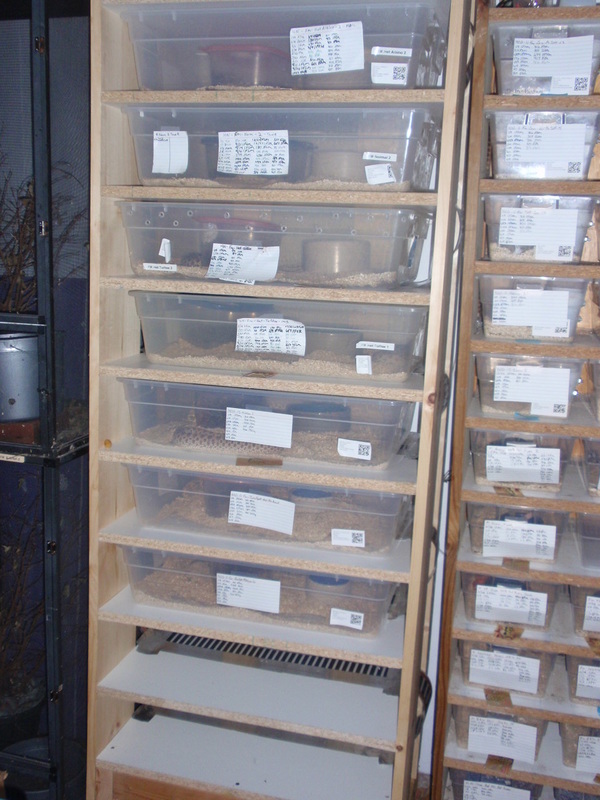 At this time we needed a few more warm spots to put roach colonies and just no warmer spot than the top part of the reptile building, especially when sitting on heat tape! I did NOT factor that extra into the estimate on how much heat tape was needed. With these racks I just chose to put 2 of the same 1x4 x 6' boards I used for the side posts on the backs. This just gives something for the tubs to hit when I push them in so the tub never goes back to far it passes the shelf. Another option would be to fully enclose the back with plyboard. Both methods will work but solid back would keep the heat in if the room is not as heated as our building is. Make sure the racks are square side to side before you screw them on. See the above photo for picture reference. Now Fill It Up Because You Are Finished!!!!! Now that you've saved a little cash building your own rack, you can easily justify buying some new animals to help fill it up! You did work hard after all!